This article is about the Baron. For the Adventure, see Target: The Trickster. "Whatever you do, don’t trust anything she touches. I promise you, it’ll bite." Araskes, the Trickster, is a Baron of the Scorn. Little is known about her beyond legends of her own creation. As the spokesman and envoy of the Scorn, she is often the first to strike. Utilising cloaking technology and leaving traps for unsuspecting enemies, Araskes has little skill in all-out battle beyond her ability to avoid it. She was captured alongside the other Scorn Barons and imprisoned within the Prison of Elders. A year after the events of the Red War she was freed by Uldren Sov and was witness to the murder of Cayde-6 at his hand. She established herself in Diaviks Mine afterward. True to her nature, Araskes engages in little direct combat, preferring to use her smoke dash ability to escape trouble. She will also deploy Web Mines disguised as loot as well as bombs made to resemble Exotic Engrams, both as a means to distract and trick Guardians as she is chased down. 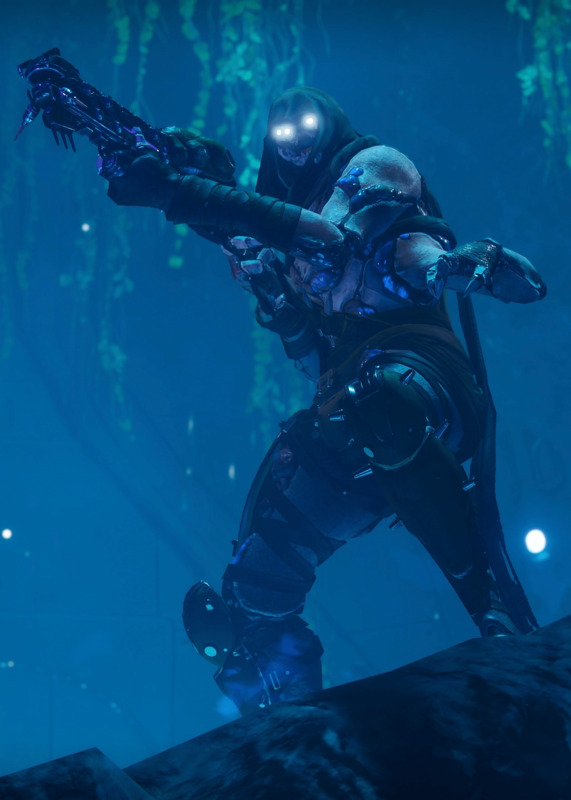 When cornered, she will chip away at The Guardian's health from a distance with her Scorn Rifle, stomp the ground when faced at close range, teleport to evade or flank her opponent, and call for aid from lesser Scorn units. Due to her tendency to slip away from an engagement, it is best to keep watch of her by following her smoke trails. Once spotted again, one must keep the attack on her as to not let her escape. "A liar and a schemer. Friendly advice: Trust nothing that she touches." Araskes has demonstrated herself to be quite sadistic, as she seems to take perverse joy in duping the Guardian and cackling insanely whenever they fall for one of her traps. She also seems to be quite unhinged, frequently laughing in her dialogue, speaking in a maniacal, almost sing-song voice, and calling herself pronouns such as "our" or "we" rather than "me" or "I". She also seems to be quite overconfident, as she lured the Guardian directly into her lair in the hopes that the Guardian would fall at the hands of another trap, which ultimately lead to her death. Araskes is the shortest member of the Scorn Barons.